Tickets are now on sale for all of Merkin Hall’s upcoming 2009/10 concerts. Those shows include the NY Guitar Festival‘s Silent Films/Live Guitars series (previously mentioned here), which features David Bromberg and Marc Ribot playing alongside Charlie Chaplin films on January 14th, Bon Iver‘s Justin Vernon (Charlie Chaplin’s The Gold Rush) with Steve Kimock (Buster Keaton’s Cops) on January 21st, and more. The full lineup, with details, is below. The venue is also hosting the New Sounds series, which includes performances by ETHEL and the Bang on a Can All-Stars. Details on those are below. Check out a video of the BoaC All-Stars rehearsing a Steve Reich piece from a few years back below too. You’ll notice Bryce Dessner of the National is in the ensemble in that video. He’s currently working on his own new piece with brother Aaron and Matthew Ritchie to debut at BAM this fall. Also, as part of their trio of “Contemporary Contexts” concerts, Merkin Hall will be bringing Signal, who will premiere a new work from Nico Muhly and UK composer Harrison Birtwistle, in May. The New York Guitar Festival returns to Merkin Concert Hall in 2010 for its 10th anniversary season. This year’s festival celebrates one of the most creative and influential personalities of the silent film era. Each night an artist or ensemble will give the world premiere of a New York Guitar Festival commissioned score for early silent classic films by Charlie Chaplin including The Immigrant, Modern Times, City Lights, The Gold Rush and The Kid. They’ll be shown along with short films by Buster Keaton and others. The festival is curated by New York Guitar Festival founder and artistic director David Spelman and features artists David Bromberg, Marc Ribot, Bon Iver, Alex de Grassi, Gyan Riley, James Blackshaw and others. 2008 Grammy nominee David Bromberg is known for his eclectic combination of blues, bluegrass, jazz, folk, country & western and rock & roll. He has recorded and performed with country blues master Reverend Gary Davis, Jorma Kaukonen, Jerry Garcia, Bob Dylan and George Harrison among others and is a master of several stringed instruments. Style-morphing icon Marc Ribot has lent his mercurial guitar sounds to collaborations including Robert Plant and Alison Kraus, Tom Waits, Elvis Costello and John Zorn. 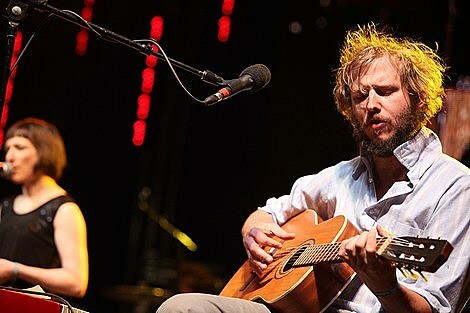 Bon Iver is the nom-de-guerre of musician Justin Vernon. His album For Emma, Forever Ago was a critical and commercial hit, making him one of the most talked-about indie artists of 2008. For this performance he will be joined by Chris Rosenau of indie rock band Collection of Colonies of Bees, whom Justin calls his “guitar mentor.” Steve Kimock is best known as co-founder and guitarist for the San Francisco jazz/rock/funk band Zero and is a veteran when it comes to performing American roots music. He’s recorded and performed with many members of the Grateful Dead family (Jerry Garcia once hailed him as his favorite guitarist), Bruce Hornsby, Pete Sears and Hammond B3 master Melvin Seals. He currently records and tours with his band Crazy Engine. Often cited as one of the top fingerstyle, steel-string acoustic guitarists, Grammy nominee Alex de Grassi is renowned for his impeccable technique, innovative artistry and compelling compositions. Over the years, de Grassi has explored a variety of world music influences and stretched his repertoire to include interpretations of jazz classics and folk melodies from around the world. He has drawn acclaim for his 14 recordings released by Windham Hill, RCA Novus, Tropo Records, 33rd Street and other labels, as well as for his live performances as a soloist and within ensemble settings. James Blackshaw is a London-based guitar prodigy who has released seven albums’ worth of mesmerizing instrumental 12-string compositions since 2004. His style is often described as “American primitive guitar” because he has been influenced by the likes of John Fahey and Robbie Basho. He incorporates elements of Indian raga music, improvisation, drone and psychedelia to create extended pieces of immense depth and pristine melody. Chicha Libre is a Brooklyn-based group that plays a psychedelic brand of cumbia music invented by the Indians in the Peruvian leg of the Amazon rainforest in the late ’60s. Chicha mashes up the melodies of Peru’s Native American population, Columbia’s cumbia, Afro-Peruvian guitar styles, Cuban guajiras, garage band Farfisa funk and the twangy resonance of American surf and spaghetti Western guitar. It’s a hybrid that sounds at once familiar and alien to American ears. Gyan Riley is an equally strong presence in the worlds of classical guitar and contemporary music. He has received commissions from Carnegie Hall, the New York Guitar Festival and the Paul Dresher Ensemble. He has performed throughout 10 European countries and across the U.S., both as a soloist and in ensemble with various artists such as Zakir Hussain, Michael Manring, Dawn Upshaw, the San Francisco Symphony, the Falla Guitar Trio, the World Guitar Ensemble and his father, the composer/pianist/vocalist Terry Riley. Come hear what’s going on right now! Merkin Concert Hall continues to spotlight the diversity and vitality of 21st century new music with world premieres and specially commissioned works. America’s pre-eminent flute soloist, Carol Wincenc, performs the WORLD PREMIERE of a commissioned work by Jake Heggie, Fury of Light for flute and piano, as well as Heggie’s song cycle The Deepest Desire, with settings of texts by Sister Helen Prejean (a protagonist in Heggie’s opera Dead Man Walking) for voice, flute and piano. The program also features Lukas Foss’s Three American Pieces arranged for flute and piano; Paul Schoenfield’s Six Chassidic Songs and George Crumb’s famous 1971 work Voice of the Whale for electric flute, electric piano, electric cello and cymbals (in commemoration of Crumb’s 80th birthday year). Jake Heggie and Stephen Gosling are the program’s pianists, soprano Elise Quagliata sings The Deepest Desire, and cellist Rafael Figueroa is featured in Voice of the Whale. SIGNAL, a large ensemble comprised of some of New York’s most gifted and innovative musicians, will perform the WORLD PREMIERE of a new work by Nico Muhly–celebrated as “one of the next great hopes for the future of classical music” by New York Magazine–commissioned by Merkin Concert Hall. The program also includes the AMERICAN PREMIERE of The Corridor by Sir Harrison Birtwistle, one of the most prominent figures in European contemporary music. This piece for two singers and an ensemble explores the climax of the Orpheus myth: his fatal glance back at Eurydice. Cited by New York Magazine as one of “the people whose ideas, power and sheer will are changing New York,” host John Schaefer has for 20 years been offering new ways to hear the ancient language of song. The New Sounds® Live series returns to Merkin Hall in 2010 for another season of adventurous new work. Three world premieres commissioned by the people! New York’s electric chamber ensemble Bang on a Can All-Stars take on new works by Nik Bärtsch, Oscar Bettison and Christine Southworth, plus more in their highly anticipated annual celebration at Merkin Hall. The PCF is a radical partnership between artists and audiences to commission works from adventurous composers. A special edition of WNYC’s New Sounds® Live with host John Schaefer. New York’s high-octane ETHEL teams up with Dutch avant-pop composer Jacob TV for an adventurous evening sure to surprise and inspire. Acclaimed as the nation’s premier postclassical string quartet, ETHEL boldly infuses contemporary concert music with fierce intensity, questioning the boundaries between performer and audience, tradition and technology. Formed in 1998, ETHEL is comprised of Juilliard-trained composer/performers: Cornelius Dufallo (violin), Ralph Farris (viola), Dorothy Lawson (cello) and Mary Rowell (violin). Quickly gaining renown outside his native Netherlands, Jacob TV draws raw material for his multi-media compositions from American media and world events, creating work possessing an explosive strength and raw energy combined with extraordinarily intricate architectural design. A program of new approaches to the art song, a form perfected by Schubert and usually restricted to piano and voice. Today, the art song is being stretched and reshaped by rock, jazz and minimalism. Featuring a commissioned work from Elizabeth and the Catapult (pianist Elizabeth Ziman and her band) and a set by singer/pianist Ed Pastorini.